You have many options when it comes to how you can whiten your teeth, from whitening toothpastes to over-the-counter whitening strips. However, none of these options deliver results as dramatic as professional teeth whitening. Drs. Dory and Khalida Stutman offer at-home and in-office Zoom! Whitening treatments that can give every patient a dazzling white smile that will stand the test of time. It’s natural for teeth to lose their sparkle over the years. Constant exposure to coffee, dark sodas, and even some of your favorite fruits can slowly age your smile. But Zoom! Whitening erases stains and leaves your teeth whiter than you ever dreamed possible. By combining the power of a highly-concentrated bleaching gel with a bright UV light. To treat your smile with Zoom!, your cosmetic dentist places a shield over your lips, tongue, cheeks, and gums. Then, the whitening solution is applied to the surface of your teeth and activated under the light in 15-minute intervals. After just three applications of the UV light, the process is complete and your bright results will be revealed! It can make your smile look up to 8 shades whiter in less than an hour! Patients who wish to whiten their smile more gradually may prefer our at-home treatment. We’ll simply give you a set of customized mouth trays and the powerful whitening gel, as well as instructions on how to use them. All you’ll need to do is wear the custom-fit trays filled with the bleaching gel each evening for half an hour for about two weeks to complete the treatment. Only your dentist can offer professional-grade teeth whitening for the best results. Custom whitening protects your sensitive gums and other soft tissues from the bleaching gel. Your dentist can help you guard against tooth sensitivity. 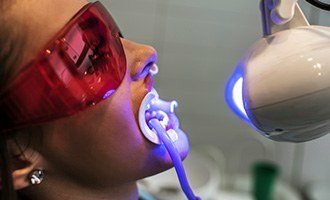 Professional teeth whitening is activated on the spot, instead of sitting on the pharmacy shelf, slowly gathering dust and losing its potency. After you have undergone your professional whitening treatment, your results should last for many months. You can make sure your teeth stay as white as possible by limiting your exposure to highly pigmented foods and beverages like coffee, soda, red wine, ripe berries, pasta sauce, and other common tooth stainers. Maintain consistent dental hygiene habits as well, brushing for two minutes, twice a day, flossing daily, and visiting your dentist as recommended. Patients who choose the in-office whitening treatment will also be given a kit for touch ups. The moment you start to notice your results fading -- long after the initial Zoom! Whitening treatment -- you can use your custom-fit touch up kit to refresh your smile. It’s an easy way to continue enjoying your beautiful results again and again. Are you interested in revealing your whiter, more youthful smile? Don’t hesitate to get in touch with our boutique dental practice in Massapequa. Contact us to schedule an appointment at South Shore Dental Care today!